Over the years, I’ve mentioned mud areas several times, and I’ve shared pictures on Instagram when I repainted the top of it last year, so when I searched my blog for a post about it, I was surprised to find I’ve never shown my mud area on the blog. I’m going to fix that little mishap right now. My mudroom isn’t really a room, so I call it a mudroom area, but really it is a high traffic pathway. It is next to the door coming in from the garage and in between the powder room (Southern word for bathroom) and laundry room. A lot happens here, though these pictures make the area look uncommonly calm. 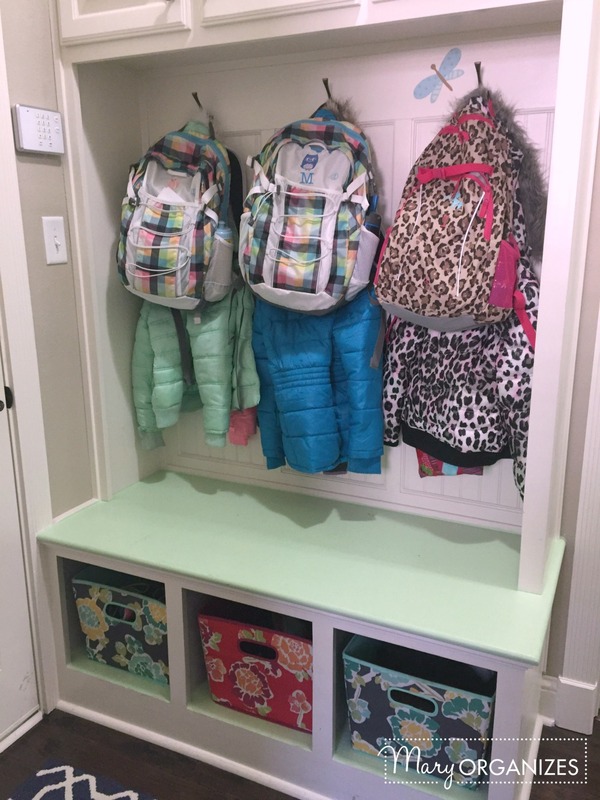 You know bloggers are famous for staging unrealistic photos of clean kid areas. And you guessed it, there is no way those baskets look that neat in those cubbies on a regular basis. 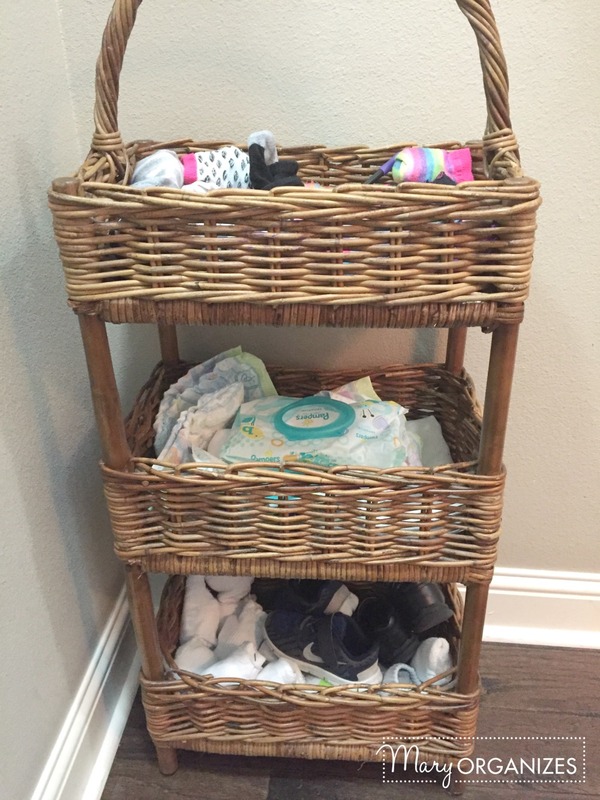 For some reason one basket is never at the same depth as another basket and they are usually crooked with shoes hanging over the edge. I admit, I did not want the picture to look like that. And why I have to have this over-active conscience to tell you, I’ll never know. Yes, I do have four children, but only my three girls have a basket for their shoes right here. I chose a rug that had a lot of movement in it, because I’ve tried rugs here with solid-ish patterns and they only seemed to highlight leaves and grass. Really, I want this rug to be covered in leaves and grass, because that means it is doing it’s job of trapping it back here … I just don’t want to see it every random glance in this direction. These are the hooks the girls are asked to put their coats and backpacks on each day after school. During the summer these usually have swim bags, purses, and other random girl things they like to hang. I like that they each have a spot that is theirs. It helps things not end up all over the place. Nearby this mud bench area is a small corner with a basket for girls socks (they all wear the same size), diapers and wipes, and the boy’s socks and shoes. And while I was taking a picture of the basket, my tiny 8 year old daughter came to check off stuff from her chore checklist. I didn’t even really plan to focus on the chore lists in this area (not sure why …). I love when photos like this can happen un-staged. Do you have a mud room or a mud area? Is yours in your garage or in your house? Good idea to keep socks basket by the door! Yes, keeping them upstairs in their drawers was wasting a lot of time in the morning when people had to run back upstairs just for socks! Great Ideas! What do they store in the baskets? And, this may be a dumb question, but do you require them to put the coat under the backpack? That seems backwards to the order in which they take them off and on their bodies. I’m thinking you mean the baskets at the top of the mud area since those were the only baskets I forgot to say what was inside. Oops! Far left, hooks and hanging tools. Middle – more socks. Right – swimming stuff. 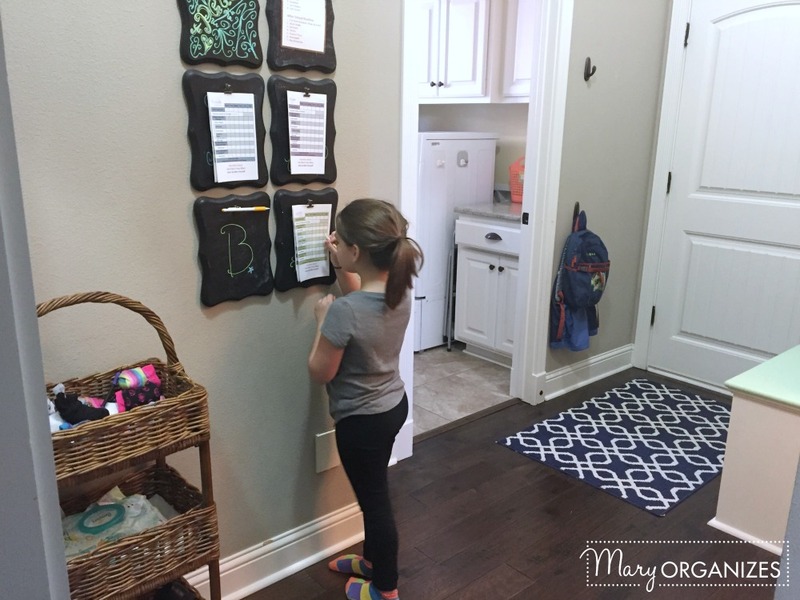 My girls are short and they have to climb up and down to hang stuff on the hooks, so it doesn’t matter an order really because they are usually doing it at the same time. I like the backpacks on the outside so the lunches can slip inside in the morning. We have a long counter in the laundry room so I put two cheap bookcases underneath and that’s where the kids’ shoes and backpacks go. It’s right by the door to the garage and keeps the kids from sitting in front of that door when they get their shoes on. 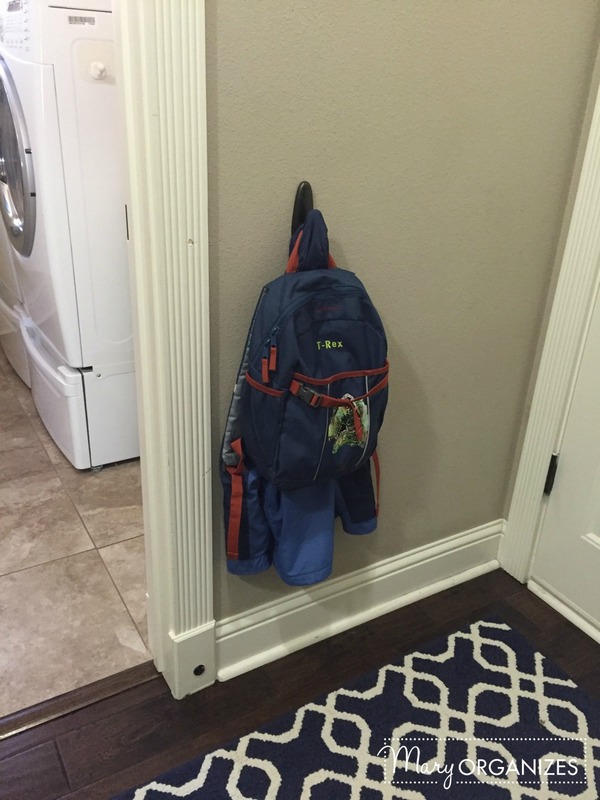 Their coats go on hooks by the garage door. It’s a work in progress for sure, but with four boys, our needs are constantly changing! Adapting to changing needs is a good thing. Sounds like you are working with what you’ve got and doing a great job! 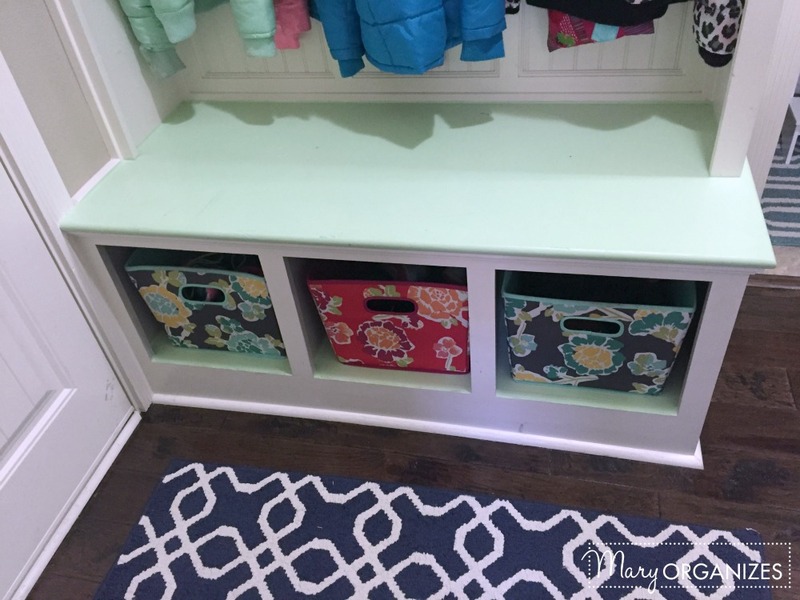 No mudroom here. We step from garage or patio door directly into the “dining area”. I have managed to make a corner area with cupboard and hooks for keys, dog leash, jacket. Also a small rug for wet shoes. But not ideal. Do you have room in your garage for a little mud area? I’ve seen people do it in there and it can work really well. Great! I wish I had a mudroom. I have a very small laundry area. No they don’t, my 10 year olds have shown me that so far! That is the advantage of being the fourth, I take all of this little shows of will power for what they are and just go with it. I wish I would have had this perspective with my oldest! 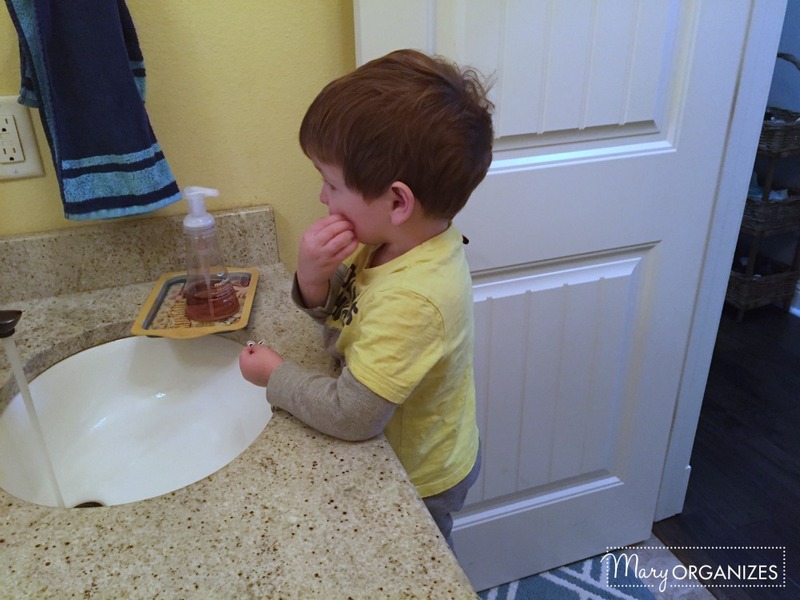 my son just turned 4 and he is still in the “I can do it myself” phase. Hubs and I have learned with our first NEVER to alternate their food in anyway without asking first! Lots of good food was deemed inedible by our 2 and 3 yr olds because we cut something “wrong”, prematurely peeled a banana, or heaven forbid poured ketchup, honey, syrup or what-have-you in the wrong places!! They sure have raised us parents well. Do you ask the kids to take off their shows when they come in? Where do they keep their shoes? The shoes are in the baskets underneath the coats and backpacks. 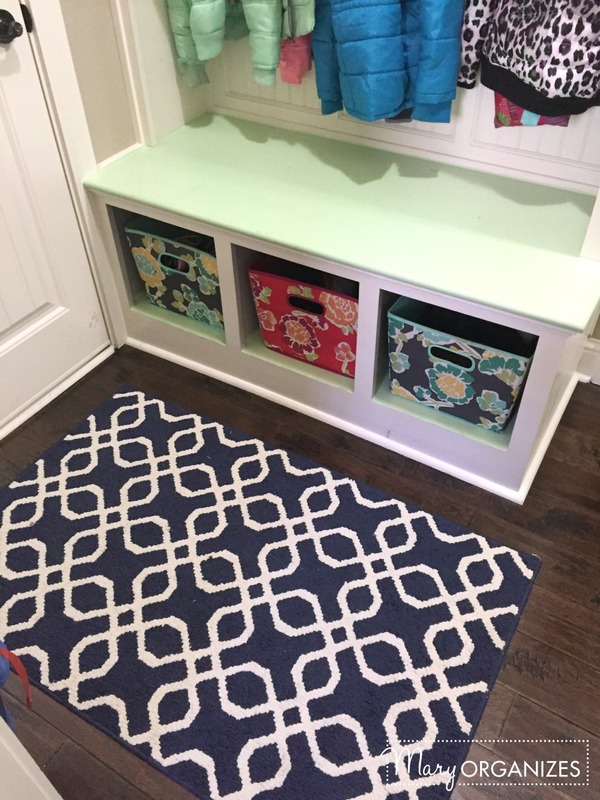 We also have a mud room and lots of white trim. I have 2 kids and a dog and have a very difficult time keeping it white. How does yours look so nice? 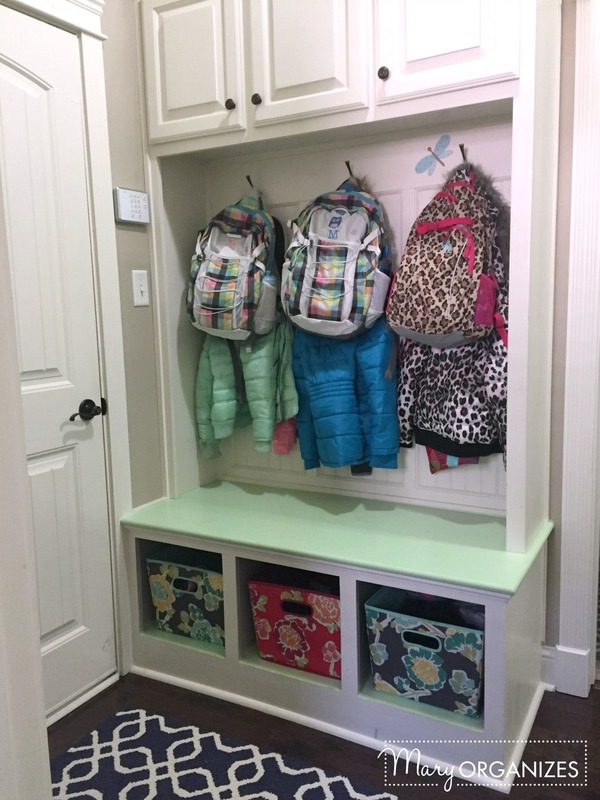 I have a similar set up, but the problem is kids plop down right in front of the door to put on socks and shoes as I try to go in and out loading the car. We are all stepping over each other. Any solution for this? Four kiddos here too! Oh and there is a bad habit of leaving shoes in front of the shoe shelves as we call it! Where did you find those bins?